Blood clot on plaster. 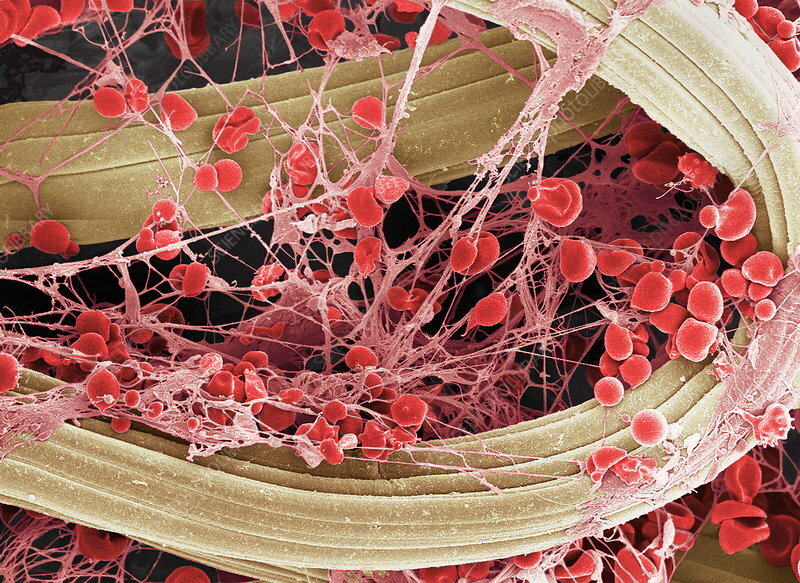 Coloured scanning electron micrograph (SEM) of blood clotting on the surface of a sticking plaster used to dress a small cut. Red blood cells (erythrocytes) are trapped in filaments of fibrin protein (pink). The fibres of the absorbent material of the plaster are also seen (brown). When an injury occurs, platelets (not seen) in the blood stimulate the formation of fibrin filaments, which enmesh platelets and red and white blood cells. The fibrin contracts around them to form a solid clot. Sticking plasters are used to help stop bleeding, and to keep an injury clean and dry during healing. Magnification: x900 when printed 10cm wide.